Vegetable beef soup has always been one of my favorite soup recipes to order at a restaurant. 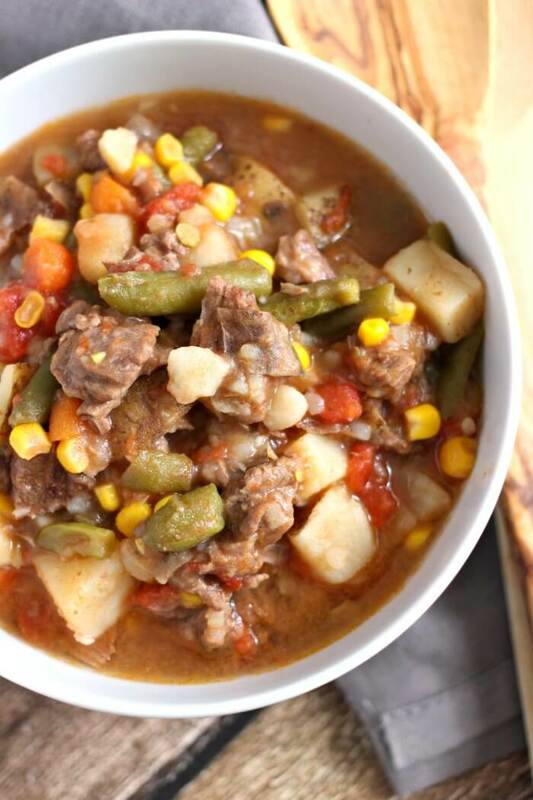 This hearty vegetable beef soup will soon be a staple in your home! Remember when vegetable beef soup was on every menu in the 80’s and wood paneled booths were all the rage? Sometimes I miss those days, and when I do – I make this ridiculously simple, and ridiculously delicious beef vegetable soup. I like to serve our vegetable beef soup with our french bread recipe and a cobb salad. For dessert, carrot cake! Potatoes – We use russet potatoes, and I don’t peel them. The peel is full of vitamins and minerals and also, why make more work for yourself! Tomatoes – Fresh tomatoes are great if you have them on hand and want to take the time to dice them, but don’t be afraid of grabbing a can of diced tomatoes. Carrots – I do like to use fresh carrots in this recipe because they will turn to mush otherwise, but if you’re in a pinch canned or frozen will add the same flavor and nutrition. 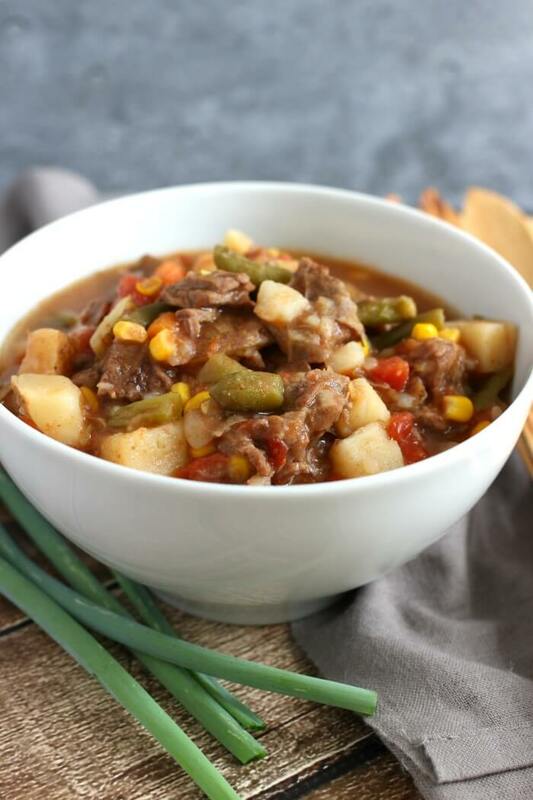 Corn – I definitely use canned or frozen corn, the thought of shucking corn for an easy vegetable beef soup – no thanks! Green beans – Fresh, canned, or frozen will work here as well with the caveat that you should use cut green beans, not french style. Beef – Any cut of beef will work but we usually go with stew meat. It works perfectly in this recipe and I love that it’s inexpensive. Another inexpensive option for vegetable beef soup is top or bottom round. Seasoned salt – I’m partial to Lawry’s, but any seasoned salt you love will work. Beef broth – You can use beef broth, bouillon cubes + water, or my personal favorite Better than Bouillon. The best cut of meat for vegetable beef soup is stew meat. Any cut of beef will work, but stew meat is inexpensive and will become tender when you cook it for a long time in the soup. There’s no sense in wasting money on a pricey cut of meat for this recipe. Occasionally we will also use top or bottom round when it goes on sale. 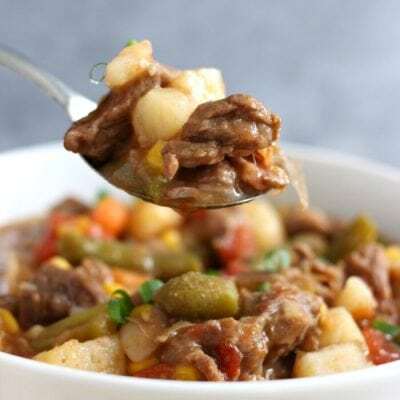 How many calories are in homemade vegetable beef soup? 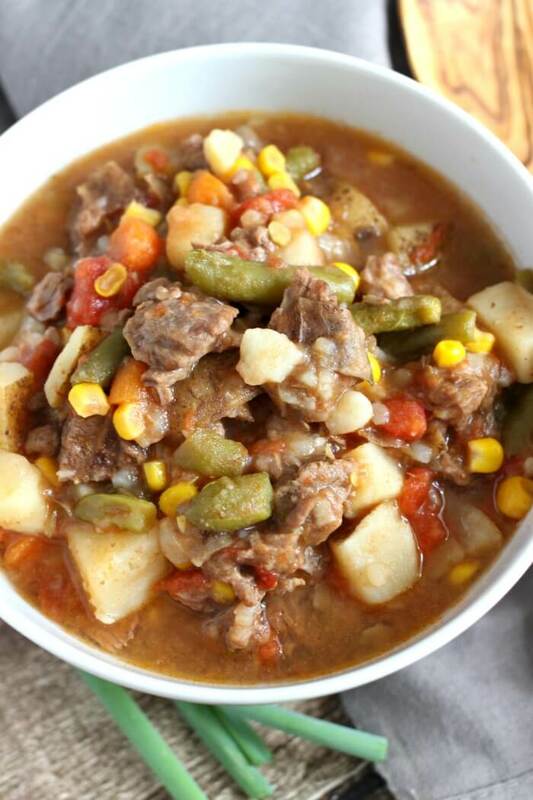 Our homemade vegetable beef soup has about 300 calories per serving. The recipe serves twelve, but if you wanted to make it six large bowls, this is a perfect filling dinner recipe! Make sure to serve it with a good bread recipe like our no knead bread to soak up all the delicious broth. The best spices to use in vegetable soup are salt, pepper, onion, and garlic. We make it easy by using a seasoned salt blend, but you’re welcome to add them separately if you like more or less of something. Occasionally I will add more garlic powder or paprika to taste. 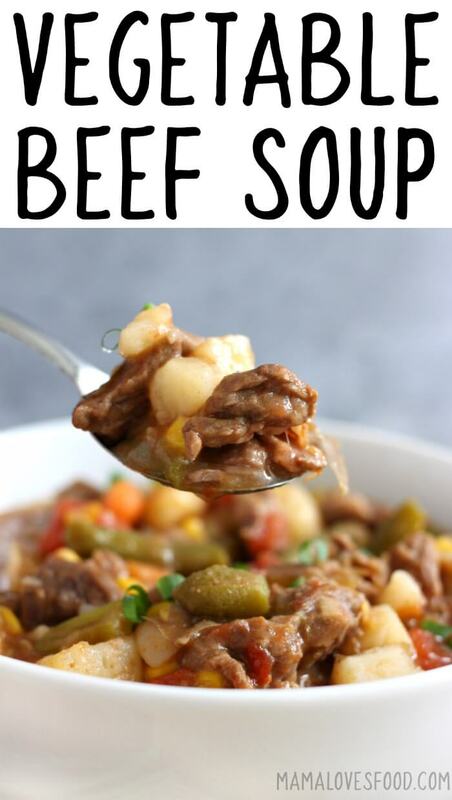 What are the best vegetables to put in vegetable beef soup? 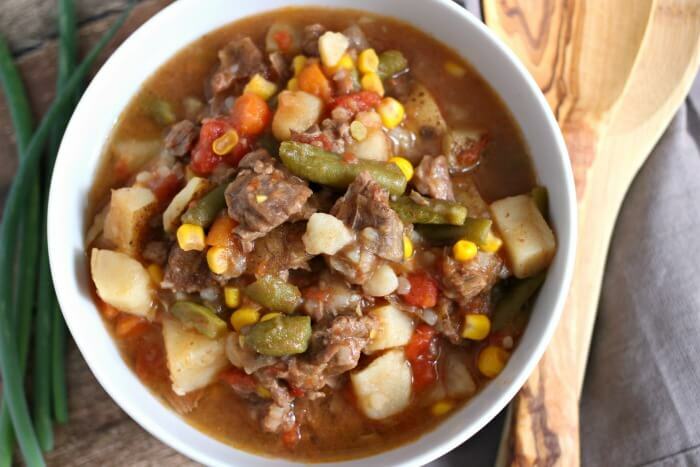 The best vegetables to put in vegetable beef soup are carrots, potatoes, corn, tomatoes, and green beans. That said, this is a great recipe for using up whatever you have lying around. 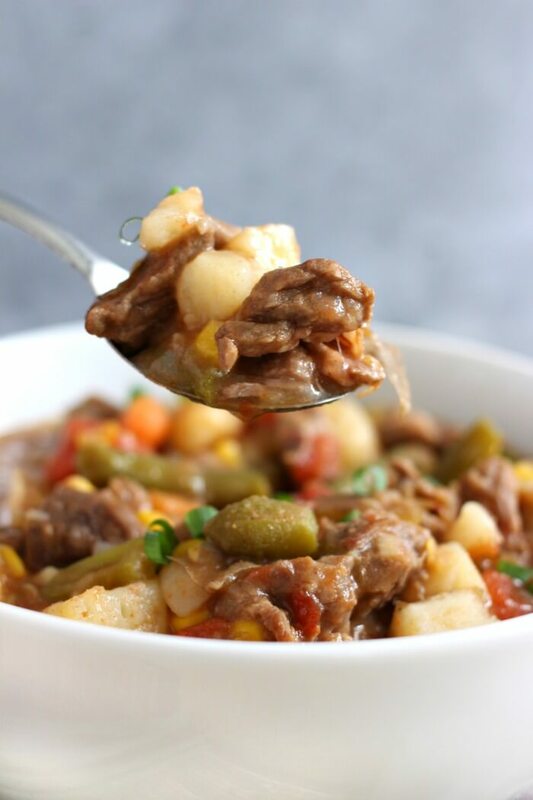 There are very few vegetables that wouldn’t taste good in vegetable beef soup! I don’t peel my potatoes. The skin is full of nutrients and it just adds more work, so I can’t figure why I would spend my time doing this! There are much better things to do – like nap. Just kidding, I have five kids. I don’t nap either. If you have fresh tomatoes, that’s awesome. If you don’t, canned works just as well. Don’t stress over this. Life has too many stressors already! Same goes for the rest of the veggies – canned, frozen, fresh, a mix of whatever’s on hand is perfectly alright! Here I used fresh tomato and carrot, but frozen corn and canned green beans! 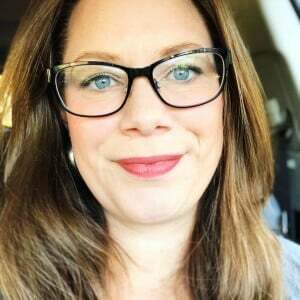 Instant Pot electric pressure cooker – Imma tell you – this electric pressure cooker, and my gas grill are the saving graces in our home. A delicious roast with carrots and potatoes in 45 minutes? Yes, please! You’re seriously going to love this one! You can also watch us make this vegetable soup recipe on YouTube! Make sure to tune in for all our live cooking shows! Optional - brown beef in a skillet with a small amount of cooking oil. Add everything to the slow cooker (I used my 7 quart cooker) and cook high 6 hours or low 10 hours. Optional: Turn instant pot to saute feature. Brown the beef in a small amount of cooking oil for 3 -5 minutes. Add remaining ingredients to the instant pot, and set to manual for 45 minutes. When cook cycle is finished, hit cancel and allow natural pressure release for 10 - 15 minutes. Optional: Brown beef on the stovetop in a small amount of cooking oil. Add everything to a large pot with oven safe lid. We like to use our 6.5 quart enameled cast iron. Cook covered on center oven rack at 350 degrees for 2 - 3 hours, until beef is tender. Browning the beef is an optional step, but it will help add more flavor as well as help the meat tenderize faster. This looks yummy and the slow cooker is perfect for these busy holiday nights! I have not used this recipe but another that slow cooks for 12 hours and veggies are not mushy just very tender. I added peas and barley. omg there was nothing left! This reminds me of the vegetable beef stew my mom used to make on cold days! Such a good recipe! This is such a classic recipe that always wins in our house! It’s an easy and hearty family favorite! Love it! I make mine similar to this, but add a handful of Pearl Barley for more flavor. Hi Patricia – Fiber is not one of the nutritional calculations we make. There are several free calculators online though that you could plug the recipe into. The more vegetables you add, the more fiber you’ll get! Yes, drain canned vegetables. Yes, you can add tomato juice if you like, although the canned tomatoes will give you the tomato flavor so it is not necessary. I would not skip the beef broth, but perhaps use 1/4 tomato juice and 3/4 beef broth instead?